A 1940s postcard of Mineral Well's Baker Hotel. Dallas Public Library. Texas’ many sources of fresh, sweet water have sustained human life for many thousands of years. Ancient Indian artifacts—metates and manos (stones for grinding grain), arrowheads and hand axes, flint quarries and rock paintings—are clustered around freshwater springs in every region of the state and give mute evidence of camp sites used long before Anglo settlers arrived. The predominant mineral in Texas’ mineral waters is often sulfur, hydrogen sulphide or iron. Among the many other minerals found in Texas waters, a few are radioactive: radon gas, radium or uranium. Many of these minerals give the water a strong flavor and odor. Instead of shunning these foul-smelling and -tasting waters, American Indians and the settlers who followed bathed in and/or drank the mineral waters, believing them to have medicinal benefits. For example, Indians carved crude bathtubs out of rocks at Boquillas Hot Springs in what is now Big Bend National Park so they could bathe in the hot mineral water. In 1909, J.O. Langford incorporated the aboriginal bathing facilities into the earliest version of his commercial spa at the site. No one knows just when America’s Indians first began using mineral waters for bathing and drinking, but as early as the Roman Empire, Europeans indulged in hot mineral baths. The elaborate network of hot mineral-water bathing facilities built by first-century Romans at Bath, England, is one of those early spas. In the Texas Almanac for 1868, Texas naturalist Gideon Lincecum extolled the “medicated waters of Texas.” The widely respected Lincecum stated that “. . . nearly every county in Texas has its mineral springs,” and today’s geologists agree. Mineral springs bubble up out of the ground or down from rocks. Underground mineral waters usually are discovered by well-drillers seeking fresh water for drinking or irrigation. Although most mineral waters are cool, others emerge from the earth at temperatures well above average body temperature. Geologists say that, generally, the deeper the source of the water, the hotter the water is. Each spring in a cluster may have a unique temperature and concentration of minerals because each may originate from a different depth. The seven springs that make up Hudspeth County’s Hot Springs, for example, vary in water temperature from 81 degrees F to 117 degrees F.
Not all of Texas’ mineral-water sources were commercially exploited. Residents near many of the smaller or more remote mineral springs used the water as a home remedy before modern medicines were developed. The owners of a few of Texas’ mineral springs opened them to the public during the 1840s and 1850s; serious commercial development began about 1860. The facilities around Sour Lake in Hardin County, though, were still relatively crude when Sam Houston spent a month there in 1863 taking mineral baths. The popularity of “taking the waters” — visiting mineral-water spas — peaked in the 1890s. During that decade, nearly 100 Texas spas, most in the eastern half of the state, welcomed thousands of guests annually. Their use began declining in the 1900s and decreased rapidly during the following 30 years. That experience was repeated across the country. In 1945, physician Richard Kovacs noted that of the 425 spas active in the United States in 1927, only 34 were in business in 1943. The simplest operations offered little more than access to the spring or well, a place to fill bottles with water, bathhouses and perhaps a camping area, simple cottages or rustic barracks. The more sophisticated establishments often advertised rigorous schedules of treatments supervised by physicians. A few were full-blown luxury spas, with elegant hotels that featured orchestras and other entertainments amid lavishly landscaped grounds, with “taking the waters” just one choice on a long list of activities. Spas promoted treatments for an exhaustive list of ailments, including, but not limited to, alcoholism, arthritis, baldness, Bright’s disease, cancer, catarrh, chapped hands, constipation, diabetes, diarrhea, “female complaints,” flux, gout, hectic fever, high and low blood pressure, indigestion, insomnia, jake leg (a neurological malady caused by drinking moonshine whiskey containing tri-ortho-cresyl phosphate, an industrial chemical), malaria, milk leg, neuralgia, opium addiction, piles, pneumonia, rheumatism, ringworm, scurvy, sour stomach, St. Vitus’ dance, toothache, ulcers, and venereal diseases, plus various other unspecified skin, eye, stomach, bladder, liver, spleen and kidney problems. Promotional literature for most spas featured a chemical analysis of the water plus testimonials from people who claimed to have been successfully treated. Some included physicians’ statements as to the efficacy of the water in curing specific medical problems, but hardly any scientific studies were done. With no documented medical diagnosis before treatment and no follow-up, confirmations of cures were virtually nil. For those unable to spend three weeks at a spa for the usual regimen of treatment, some companies bottled their water and sold it by mail order. In 1910 alone, Mineral Wells establishments shipped more than 3 million bottles of water, and in 1914, 15 Texas companies were sending mineral water to distant markets. Some companies distilled the water and sold the resulting solids as mineral salts or crystals, to be reconstituted by the buyer with tap water. The first Anglo to make medicinal use of the mineral springs of Lampasas was probably Moses Hughes, who brought his ailing wife there in the 1850s. When her liver problem was “cured” after 21 days of drinking the water, the Hughes moved permanently to Lampasas. As news of the healing waters spread, others joined the Hughes family, and the town was established. Lampasas’ Hancock Springs contained enough sulfur that, according to an 1889 account, “Fumes can be smelled fifty yards or more, and are so strong as to tarnish gold coins, to the color of copper, in fifteen minutes, if exposed to the open air near the springs.” Nearby were the not-so-stinky Hanna Springs. Most visitors during the 1870s camped out around the springs in tents. They created their own simple diversions, shared their treatment experiences, and attended an occasional singing or camp meeting. After the arrival of the Gulf, Colorado and Santa Fe Railroad (GC&SF) in 1882, a group of Galveston railroad men developed the reeking springs into the “Saratoga Springs of the Southwest,” equating it with the famed New York mineral-springs spa that attracted a wealthy Eastern clientele. Near Hancock Springs, they built the grand 200-room Park Hotel, with a large dining room, ballrooms, and 19th-century luxuries such as carpeted hallways and electric lights throughout. An orchestra provided year-round entertainment. In 1883, the Park Hotel was the most elegant resort in Central Texas. The Hanna Springs Company built a handsome pavilion over its springs, with lodging and a large entertainment hall upstairs and a bathhouse downstairs. Unlike the campers, hotel guests came more for social diversion than for the mineral water. Lampasas flourished, but its popularity began declining after the GC&SF extended its tracks to Ballinger in 1886. Although business was waning, Hanna Springs alone recorded 6,000 baths taken during 1888. But by 1891, the Park Hotel’s business was in the red. For several years, the Keely Institute operated a treatment center for alcoholics in the building. In 1894, Centenary College moved in; in 1895, the main building was destroyed by fire. A few visitors continued to camp out at the springs through the early 1900s. When J.A. Lynch drilled a well in Palo Pinto County in 1880, the water he found was smelly. But Mrs. Lynch drank it, and it seemed to cure her rheumatism. The following year, Billy Wiggins drilled nearby what came to be called the “Crazy Well.” The origin of the name is vague, but the water from it and several other area wells contains significant quantities of lithium, a substance used today to treat bipolar disorder (manic-depression). Believing in its curative power, people piled into Mineral Wells to drink the water. Some returned home; others settled in and drilled their own wells. An 1893 article reported that “40-plus” wells were operating commercially in the city. By 1909, Mineral Wells had 46 hotels or boarding houses, and published reports said that by 1910, some 150,000 people a year were visiting the wells. Of course, visitors did not drink water all day. Entertainments ranged from games of dominoes and viewing the area’s scenic vistas to riding donkeys to the top of East Mountain, attending shows at the 1905 Chautauqua Theater, or riding a streetcar to Elmhurst Park, a 100-acre amusement park with a bandstand, cafés, merry-go-round, lake, and a casino. When the Crazy Well Hotel, built in 1915, burned 10 years later, brothers Hal and Carr P. Collins bought the site. In 1927, they opened the renamed 200-room, seven-story Crazy Water Hotel as a posh resort hotel. The Crazy Water Hotel boasted such amenities as barber and beauty shops, dress shop, drugstore, doctors’ office, curio shop, florist and valet service. The Crazy Water Hotel was dwarfed in 1929 by the opening, 35 days after the Oct. 29 stock-market crash, of the opulent 14-story, 450-room Baker Hotel, complete with gymnasium, 18,500-square-foot drinking pavilion, drugstore, dress shop and bowling alley, all topped by a roof garden and dance floor. The Baker attracted such celebrities as Will Rogers, Judy Garland, Tom Mix, Gen. John J. Pershing, Marlene Dietrich, Jean Harlow, Sam Goldwyn, Jack Dempsey, Clark Gable, Helen Keller, Roy Rogers, and even the Three Stooges. The Crazy Water Hotel began bleeding red ink until the Collins brothers began selling Crazy Water Crystals, the dehydrated minerals from Crazy Well water. The Crazy Water Crystals radio show promoted the product to the entire nation on the NBC network from the lobby of the Crazy Water Hotel. It featured a lineup of popular country musicians and comedians, plus earnest endorsements of the benefits of using the product. Even in the midst of the Depression, the Crazy Water Company made as much as $3 million per year from mineral-crystal sales. Today the Crazy Water Hotel is a retirement residence, and the Baker stands silent and empty. While digging to find a water supply for the city of Marlin’s 2,500 residents in 1891, city engineers struck sulfur-laden water that gushed out of the ground at 147 degrees F. Several physicians interested in the curative properties of Marlin’s water established clinics, bathhouses and sanitariums. More wells were drilled, hotels and boarding houses opened their doors, and by 1900, Marlin was a popular spa emphasizing medical water treatments. So well-regarded was Marlin’s water that the New York Giants baseball team trained there from 1908 to 1919. Perhaps it was mere coincidence that the Giants won the National League pennant in 1911, 1912 and 1913. In the 1920s, the Marlin Hot Wells Foundation for Crippled Children established a hospital to treat young polio victims. By the 1930s, up to 100,000 health-seekers visited Marlin annually. Although Marlin’s mineral-water business survived the Depression, principally because Marlin’s doctors shifted their emphasis from baths alone to using baths as part of a therapy regimen, interest subsequently diminished. Despite sporadic attempts to revive them, Marlin’s mineral-water establishments were pretty much gone by the 1960s. Although the San Antonio area had at least three popular mineral-water spas, neither of the others achieved the reputation for luxury of the Hot Wells Hotel and Bath House, which opened in 1900 near San José Mission. Among the multitude of bathing facilities were three swimming pools, 45 private bathing areas and 200 individual dressing rooms, plus six different kinds of baths. “Taking the waters” was almost an afterthought in the three-story pleasure palace, which quickly became the place to be among San Antonio’s social set. Besides dances, bowling, swimming, concerts, lectures, tea on the verandah, and domino parties, diversions included an ostrich farm, a small zoo and gambling at the Hot Wells Jockey Club, complete with full-time bookie. The visiting celebrity list was long and included the likes of Teddy Roosevelt, Mexican dictator Porfirio Díaz, Douglas Fairbanks, Rudolph Valentino, Sarah Bernhardt, Will Rogers, Hoot Gibson and Tom Mix. The Hot Wells’ popularity died off by the early 1920s. The burned ruins of the grand resort still can be seen in southeast San Antonio. Several factors contributed to the demise of mineral-water spas. • The U.S. Food and Drug Administration’s 1930s campaign for pure foods and medicines. The FDA seized shipments of some bottled mineral water and packages of salts and crystals, claiming either that the products were contaminated or that the labels contained fraudulent claims, or both. Most mineral-water spas were shuttered by 1940. A few, such as Stovall Hot Wells and Chinati Hot Springs, for example, continue to offer hot mineral-water baths to the public. — written by Mary G. Ramos, editor emerita, for the Texas Almanac 2006–2007. • Brune, Gunnar, Springs of Texas, Vol. 1; Branch-Smith, Fort Worth, 1981; reprinted, Texas A&M University Press, College Station, 2002. • Fowler, Gene, Crazy Water: The Story of Mineral Wells and Other Texas Health Resorts; Texas Christian University Press, Fort Worth, 1991. 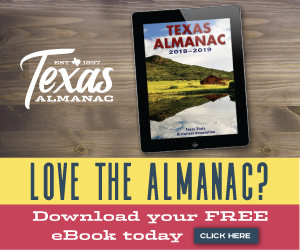 • Handbook of Texas Online (https://tshaonline.org/handbook/online/), s.v. Collins, Carr P.; Cypress, TX; Dalby Springs; Hardin County; Hot Springs, TX; Hubbard, TX; Hughes Springs, TX; Hynson Springs, TX; Indian Hot Springs; Kenedy, TX; Kingston Hot Springs; Lampasas, TX; Mangum, TX; Marlin, TX; Mineral, TX; Mineral-water Springs and Wells; Mineral Wells, TX; Oran, TX; Piedmont Springs; Putnam, TX; Rosborough Springs, TX; Saratoga, TX; Sour Lake, TX; South Bend, TX; Sutherland Springs, TX; Terrell Wells, TX; Thorp Spring, TX; Tioga, TX. Lampasas, Texas: Its Mineral Springs; Poole Bros., Chicago; reproduced 1972 for Lampasas’ First Spring-Ho Festival. • Lincecum, Gideon, “Medicated Waters of Texas,” Texas Almanac for 1868; Galveston News, Galveston, 1867. • Valenza, Janet Mace, Taking the Waters in Texas: Springs, Spas, and Fountains of Youth; University of Texas Press, Austin, 2000.